got split in two as a big limb fell off, leaving only the front door. Not sure if birds reuse nests from the previous year, but this one got stripped from its moorings. For a post at my princetonprimer.org blog entitled Thousands of Trees Remain Standing after Hurricane Sandy, click here. Recently, walking through a pleasant blizzard of falling willow oak leaves on Franklin Avenue, I remembered an ode to willow oak leaves I had written in the fateful fall of 2000 while living in Durham, part of North Carolina's Research Triangle. It was this time of year, in a city whose streets were and still are lined with willow oaks, and the enormous specimen in our yard was laying down a fresh layer of soft, attractive mulch. We had long since given up trying to grow lawn in deeply shaded piedmont clay, in favor of letting pine needles and willow oak leaves fall where they may. The pines down there are loblolly and shortleaf. Unlike the more northern white pine planted in Princeton, they are "self-pruning", meaning they drop their lower limbs to eventually become a vaulted canopy, creating an expansive, protected, cathedral-like space beneath, through which leaves and needles make their long, idiosyncratic descents to earth in the filtered light. The piece below was published on the editorial page of the Raleigh News and Observer as one of their periodic pastoral pieces, almost certainly completely overlooked in the tumult following the Bush-Gore election that had taken place the day before. The narrow leaves of willow oak spin earthwards, catching flashes of morning light. In walks along the treelined canyons of city streets, we are all victors in a ticker tape parade. The sun's rays, having lost their summer harshness, now angle into the sheltered air beneath trees, illuminating the languid descent of leaves from vaulted canopy. Not all leaves are so elegant. Pine needles plunge earthward like clouds of arrows. The broader leaves of maples fall in rocking zig-zags. But willow oak leaves are so designed to celebrate their momentary freedom in one long graceful pirouette. They spend summer clustered overhead, anonymous in dense masses of green. Then, made expendible by autumn's chill, refined of all colors but gold, they become a million individualists in their first and last dance back to earth. In loose embrace with gravity they fall, each spinning in its own manner, at its own tempo, each captured by the sun's beaming light for all time and but for a moment. The young girl next door tries to catch one, and quickly discovers how illusive they are--so tangible in their approach, yet like phantoms unwilling to have their only dance cut short. Having reached the ground, again anonymously massed, they mingle and merge and return by degrees to the soil from which they came. At such times, it is hard to think of leaves as anything but a gift. In the competition between lawn and leaf for my heart, lawn has had to yield. I used to pick up the sticks, and rake the leaves, and mow threadworn grass. But now I channel my yard's sylvan tendencies rather than struggle against them. The leaves fall where they do for a reason: to soften the soil, to catch the rain, to help dogwoods through the droughts and give kids one more reason for delight. What pleasure to trace a leaf's whimsical flight, and find at bottom a sense of rightness and rest, rather than impending chore. The Triangle is a forest masquerading as metropolis, and we are the beneficiaries of its golden rain. As the cracks in our asphalt driveway slowly deepen and spread, the thought of having porous pavement such as this becomes more and more attractive. Given the heat-island effect of asphalt in summer, and the runoff it sends down the slope during heavy rains, it would be nice to have pavement that absorbs some of the rain and turns less sunlight into heat. Each plug of soil in the concrete matrix looks like a different plant exhibit. It's basically a driveway you can mow. This one, on Linden Lane, was installed about five years ago, and looks to be aging well, apparently without need of the recurrent maintenance an asphalt driveway requires. One of the first trees to shed leaves in the fall is the white pine. Though it's an evergreen, it has as distinct and coordinated a dropping of leaves as any deciduous tree. as the 2-year old needles turn brown and fall off, leaving the 1 year old needles to remain through the winter and another growing season. Other evergreen species have the same cycle. Here's a spruce tree on Hamilton Ave. shedding older needles as a means of reducing the amount of living tissue exposed to the stresses of winter. Alert! An extraordinarily large spider web was observed at Mountain Lakes recently, spread across the entire extent of the earthen dam below the lower lake. The spider was nowhere to be found, but is reported to have only half the normal number of appendages. Follow-up inquiries revealed that the webbing is designed not to catch anything, but instead to spook the geese that might otherwise eat the newly planted grass on the dam. More research is needed, but initial observations suggest that the spiders are doing better at outsmarting the geese than most humans. Morning sunlight, leaves still wet from yesterday's rain--what better time to capture the dazzling beauty of......What might this be, growing beneath a spruce tree on the well-coiffed grounds of Westminster Choir College? One clue is in the leaves of three. Best appreciated at a distance, it's well away from where anyone might walk, so does no harm. Some groundcovers are content to cover the ground, slowly expanding year to year. Looking up Hamilton Drive near Harrison, here's some Lamb's Ears (grey), and some sort of Sedums further up. fencecovers, sidewalkcovers, wallcovers, and probably even roofcovers over time. Only the existence of moving objects--the abrasion of passing people and cars--keeps it from expanding to become a towncover. As with other vine species, english ivy blooms only on the climbing portion of the vine. and, say what?, iris? Maybe fall is the new spring. One plant encountered during a recent visit to Princeton Day School (see post about their extraordinary school garden project at PrincetonPrimer.org), is teasel (Dipsacus sp.). It has a bristly grace. Not native to America, it shows moderate invasive capability. I tend to group it with other moderately invasive species moving east from the midwest, like Queen Anne's Lace, interesting and attractive in some ways, but also with the potential to displace native species over time. Pampas Grass is in its full glory right about now. These specimens, along Cherry Valley Road, surely help differentiate their owner's driveway, on dark, stormy nights, from all the others along the road. Given the human transformations of habitats, it's common for plants to be rare in their native range, and pampas grass is no exception. It's easier to find in suburban landscapes of the U.S., or escaping into wildlands of southern California, than in its native habitat--the pampas of Argentina. This I discovered by driving through the great expanse of grassland west and south of Buenos Aires years back. Only after two days of driving through lands frequently modified with ditches and agriculture did we arrive in a valley where the pampas grass grew--with plants considerably smaller than the towering specimens we see here. Most visitors to Farmview Fields, across the Great Road from Coventry Farm, go there for soccer or baseball. I was there last week to check out the retention basin. 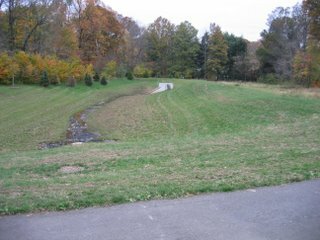 It's tucked behind the soccer field, in the far back of this photo, essentially a big scooped out area designed to hold stormwater runoff from the parking lot and slowly release it into the stream, in this case Pretty Brook. They're common in housing and office developments around town, and are usually mowed to look like sunken lawns. Most don't draw attention, but this one actually has a sign, and is mowed only once a year, if that. To the right of the mowed pathway you can see big bluestem grass leaning this way and that, fine fodder for the woodland bison that once lived hereabouts. When I was naturalist for Friends of Princeton Open Space, and visiting the park to watch my daughter's soccer games, I decided that the mowed retention basin was an eyesore and a waste of gas. Its short grass wasn't doing a very good job of filtering nutrients and pollutants out of the runoff, and the turf was of little use for wildlife. Eric Schrading of Partners for Fish and Wildlife came to the rescue, offering to replace the turf with native "warm season" grasses (Indian grass and big bluestem are tallgrass prairie species that do most of their growing during the hot summer months). The effort was federally funded, at no cost to Princeton Township. Despite the requisite drought (there's always a drought after someone plants a native prairie), many of the grasses grew and prospered, and I added some local genotype wildflowers like Hibiscus moscheutos and late-flowering boneset. Goldenrods came in on their own. Here's the before shot, in 2006. Here's the basin last week. The late-flowering boneset (white) has spread, and in the distance is a nice patch of woolgrass (reddish brown) that came in on its own. This is the best shot I have thus far to show the potential for turning drab basins into beautiful habitat. Last week, the monarch butterflies were clearly in agreement with the change, feasting on nectar in preparation for their long flight south to Mexico.